Here’s the punch line of this post: if you don’t have a solid journaling habit you don’t know what you are missing out on. For the longest time I stayed away from maintaining any kind of a journal or a personal planner because I thought that it was too time consuming and wouldn’t provide any real benefit. I’ll come right out and admit it, I was very, very wrong. I’m sure at some point journaling can become excessively time consuming to the point where it prevents you from getting anything done, but that can only happen if you let it. The reality is that 5 minutes of journaling a day can make you a happier, more productive person. I’ve found the bullet journal to be the best system out there for managing your calendar, improving your mood, getting things done, and keeping your sanity. 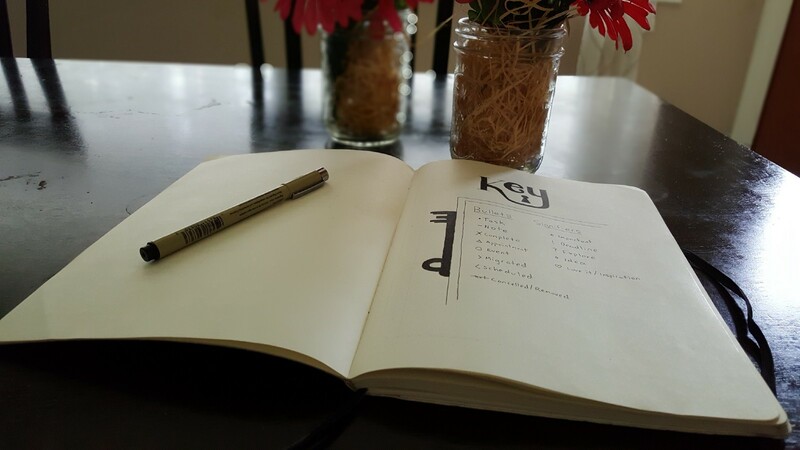 But before I go over how I set up my bullet journal to help me keep my life on track, it’s important to notice a few key things about why a journal is a good idea in the first place. I actually don’t remember where I heard that quote, but it’s written down in my journal where I attributed it to Mike Vandy. The fact that I don’t remember where I heard it (my best guess is a podcast) or who Mike Vandy is just illustrates this point. The quote stuck with me because I wrote it down and my journal can remember it better than I can. The reality is that there are lots of things that you need to get out of your brain and on to paper. Upcoming appointments, tasks that need completion, notes you want to remember, half-formed ideas that you need to work on, etc. If you don’t write these things down they will get pushed out of your brain as you need mental processing space for other things. There’s a chance that you might be able to hang on to a few of them, but for the most part most of your mental energy is going to be wasted. Not only is writing things down good for long term retention, it’s good for working through a problem with your short term cognitive capacities as well. In other words, you think better on paper. If you’re working through a problem or trying to brainstorm ideas, writing your thoughts down can be incredible helpful. You are almost better able to objectively “see” your ideas as you can physically see them written on paper. Writing ideas down also helps keep you from dismissing good ideas that didn’t sound good at first. When you write them down, you are forced to keep considering them and it can lead to a “eureka!” moment. With a journal there’s no random scraps of paper everywhere with bits and pieces of ideas. You have one neat and tidy location that has everything together. This not only helps you find things, but it also gives some context to your entries. You can usually look at something that you wrote down and know when it was and see what else was going on at the time. You basically have a map of the evolution of your thought. I love flipping through the pages of my bullet journal. I can see what I was working on, thinking about, and learning over a certain period of time and it helps remind me where I’ve come from and where I’m going. So a journal is a good idea, but what is a bullet journal and why should it be something you consider doing? Good question. The Bullet Journal system was designed by Ryder Carroll as a system that you can use in any notebook. Because the system doesn’t rely on the existing structure of a planner, it is highly flexible and adaptable. With the Bullet Journal if you discover something that might work better than what you are doing, you can change your system in an instant. When I first heard about the five minute journal I thought it was really cool, so I just integrated it into my Bullet Journal. No problemo. This also means that the journal can get as artsy and creative or as plain and minimalist as you want it to be. This method of entering information stays the same throughout all the components of the Bullet Journal, whether you are working on your daily to-do list, your monthly calendar, or your “at a glance” calendar, known in Bullet Journal terms as your future log. I like to have my first couple of spreads in my Bullet Journal be dedicated to my Future Log, a longer term calendar that shows me all the upcoming months for the next year or two. So if we schedule time to visit family three months from now, that goes into my future log. Essentially the future log is just a temporary holding ground. Once the month in question comes up, there will be an entire spread created that is devoted entirely to that month and all the info from the future log will be “migrated” into the new monthly log. The monthly log and the daily log are the spreads you will consult most frequently. The monthly log is a both a standard calendar, a visual representation of the month where you can schedule appointments and to-do items, but it’s also a list of things that you need to do. The way it works is that you start filling out the list portion with the things that you know are coming up or that you want to get done. Then you assign the ones that already have dates to the appropriate place on the calendar and find a home fro the ones that don’t have dates. In other words, you list what needs to be done, look at what time you have available to do it, and then assign certain items to available days. This is where you put your daily to-do list as well as any notes you want to remember or any notes that you want to write down during the day. When you create this list each day, you first consult the monthly log to see what you already have scheduled. The daily log works best when you have only a few to-do items and you have carefully selected and prioritized them. This takes a bit of work each morning (or the night before), but reflecting on your priorities is well worth it. One of the best things about the bullet journal is its flexibility. You can do almost anything with it. If you search on YouTube or Instagram, there’s an almost endless variety of creative additions or changes that people have made. To cover one of the more simple ones, what if instead of writing notes that you want to review later in your daily log, you devoted a page just for accumulating notes. This way you could find your notes without having to sift through all your “to-do” lists. This is what I did in creating a “Brain Dump” page for myself in my bullet journal. I can’t even begin to tell you what a fruitful habit keeping a journal has been. I only started because my wife was going to do it and I thought it would be a fun thing to try together, plus it would be a good way to review our calendars together, something that is very helpful for spouses. It’s been amazing. It has helped me get more important things done than I dreamed I could have and it’s helped me write down more of my ideas and notes than I used to. I routinely go back through my brain dump and find something helpful that had occurred to me sometime in the past but that I was too busy to implement. Once you get going you really realize how powerful it can be. So I highly recommend that you develop a journaling habit. You don’t need to do it like me, but if you are interested in how I do it, I have a walkthrough video of my journal below. Some things have changed since I recorded the video: for instance I used to have a “gratitude log” but now I just mention three things that I am grateful for in every daily log. This has caused me to be more faithful with keeping up with a daily habit of gratitude. I hope you enjoy the video, and I hope it inspires you to get started.